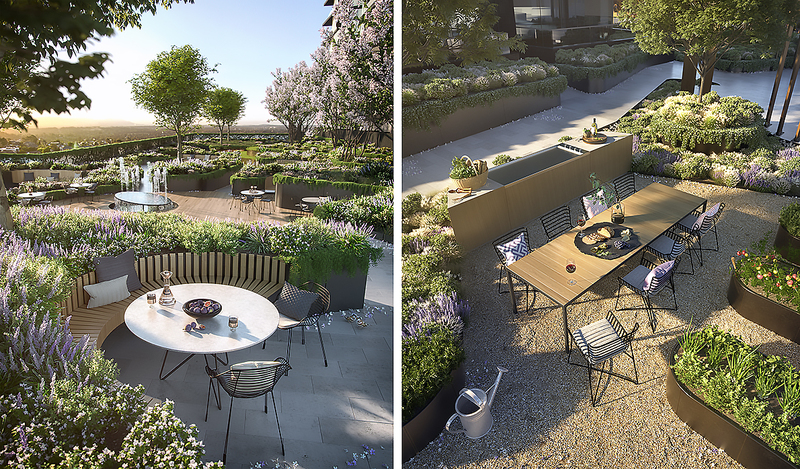 Today Urban.com.au speaks to Erwin Taal, Senior Associate at ASPECT Studios about the office's work on Golden Age Group's Sky Garden development above The Glen Shopping Centre. Taal says the project provided a very challenging brief for a broad scale landscape that is not evident at first glance. A creative solution was required to provide the immersive landscape experience desired within the structural constraints of building over a retail precinct. This was achieved through the terracing of the landscape through using several lightweight shallow landscape trays creates an implied depth to the landscape that would otherwise not be possible. This depth is enhanced through the careful arrangement of plant heights to enhance this effect. 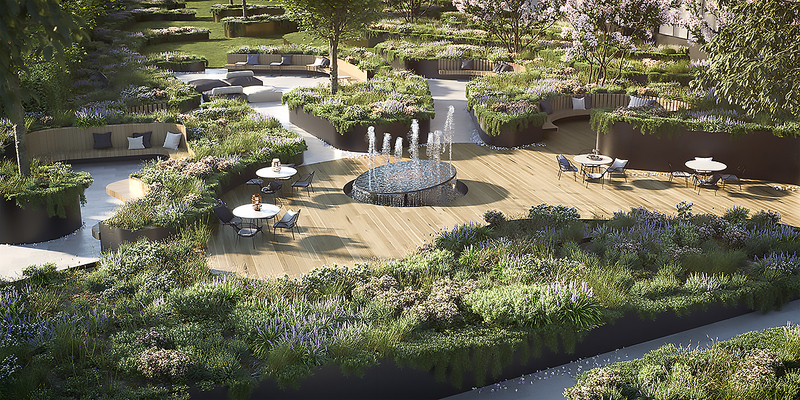 Urban.com.au: What was the brief from Golden Age for the landscaped spaces within Sky Garden? passive enjoyment through to active recreation. The brief also called for the establishment of a green landscape with a range of planting approaches that would create an engaging immersive environment for the residents, within the limitations of the building structure. This desire for immersion within the landscape was amplified through the refined “Sky Garden” approach that was requested by Golden Age. U: Did the design concepts of the five elements inform a set of guidelines which assisted in the collaboration between ASPECT, Rothelowman and DKO Architecture? ET: ASPECT Studios are one of the forerunners with extensive experience and knowledge of green roof design. We worked closely with Rothelowman & DKO to ensure a seamless interface between the landscape and architecture. From the outset, we proposed that the residential podium take on a sympathetic design approach towards the concept for The Square and Level 1 Retail to ensure a considered and consistent design concept between all facets. This was in keeping with the geometries pursued within the Rothelowman design of the residential towers. Our concept successfully reflected the seamless integration between internal and external as well as the architectural exploration of the five elements to effectively create one consolidated residential offer. U: What influence did the architecture of the three apartment buildings have on the design of the landscaped spaces? The linear landscaped forms were subsequently modified to become more curvilinear and less linear in nature, again as a reference to a more intimate Sky Garden approach, whilst retaining the overall arrangement of the outdoor rooms. U: What were some of the challenges for designing multi-generational spaces without over cluttering the spaces or diluting the design intent? ET: The linear arrangement of outdoor rooms along the base of the towers and multiple points of entry surprisingly assisted in dispersing various programmed spaces along the podium. We divided the programming of the outdoor rooms into active through to passive use, and formal through to informal settings to determine the range of activities to occur within each room. Some of the outdoor rooms naturally lent themselves to a younger or older generational focus, but we felt it important that the interaction between all users was a desirable element, much as a typical urban environment. By off-setting the connective circulation from the activity of the spaces, a higher intensity of activation was therefore possible without disrupting access to other outdoor rooms within the arrangement. U: Sky Garden sits above the Glen Shopping Centre which is undergoing a staged redevelopment adding green spaces within the centre environment. How do you see the roles of shopping centres changing in the future and bringing more of nature in? the desire for more meaningful connection to nature within our lifestyled environments. Shopping Centres are rapidly evolving to capture, and even drive, this fusion through diversifying their offer beyond that of traditional retail. Incorporating nature through the creation of extensive internal and external landscaped environments provides breathing spaces within these intensified environments and actively encourages prolonged occupation. Whilst not a re-creation of real nature, the use of green roofs and podiums are a controlled representation of it which has been tailored to suit our changing social and urban fabric and can offer many of the environmental, microclimatic and biological benefits.